As a service to humanity I am beginning to compile a list of objects and experiences that are over-rated. From time to time, I propose to share with you the fruits of my research and analysis. The items on my list all have some quality--had they no merit at all they surely would never have become over-rated. What characterizes the truly over-rated icon is that its reputation is all out of proportion to the enjoyment, satisfaction, or benefit that can be, or commonly is, derived from it. Admittedly Beethoven’s Fifth Symphony is a pretty good symphony, well above average; a few tortured souls might even place it in their personal top 50. The "experts" concede that it is well crafted. It made a big splash when it was premiered in 1808, as it seemed a bit of a novelty item back then. Imagine a piece of music without tunes--without themes even! A first movement motto--Fate--da da da daaah--death is knocking at your door--very Romantic and sublime. But that was so, so two hundred years ago. No one cares about death or fate anymore. Since 1808 the old fifth has had two revivals. One, during WWII the big one (q.v. ), on the basis that it’s motto was Morse Code for "V" and therefore it stood for victory. Even then it couldn’t compete with that clever alphabetic intro to "I’ve Got a Girl from Kalamazoo." Then, during the late seventies, it was transformed into the disco hit, "A Fifth of Beethoven." The fact that the exposition section at the beginning of the symphony makes the transition to disco so easily and so felicitously makes one wonder about the original. 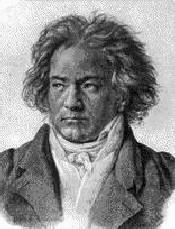 Ask yourself, who ever listens to the last three of the four movements of Beethoven’s Fifth? I happen to like them all better than the opening one--especially the scherzo--but quality back there doesn’t count for much if so few people listen to it. If the symphony was being played for them most people would not identify it as anything "good" unless they happened to be listening to the first movement. Correction, listening to the opening section of the first movement. Take "da da da daaah" off the aural screen for a second and you might as well be playing something by Cherubini or Méhul as far as most people are concerned. Now, you see we have reduced what people really value about Beethoven’s Fifth--and, to be honest, about Beethoven as a whole--to a bit of Morse Code. Is it so great that Beethoven unknowingly discovered a single letter--before Samuel Morse (q.v.) --of that now obsolete form of telecommunication? And, when you think of it, "v" is not such a hot-shot letter. The Roman alphabet originally used a single symbol for both "u" and "v." So it is really just half a letter, hardly anything at all. And the Romans pronounced it like a "w." So when Caesar (q.v.) came, saw, and conquered, he said: "Weenie, weedy, weakie." What a weenie! I wonder what pieces an unprejudiced listener would enjoy most if given the run of a shelf of CDs filled with a complete set of Beethoven. As Peter Schickele once said, "Beethoven wrote some pretty good country dances." Perhaps Beethoven would be most lauded for his fine job setting Scottish folksongs. I contend that it doesn’t matter what the listener decides, as long as he or she decides for him or herself. Other classical pieces suffer from the Beethoven’s Fifth Syndrome. Everyone, at least everyone who has lived in the brave new world ushered in by Stanley Kubrick’s 2001 (q.v. ), is familiar with the impressive opening to Richard Strauss’s Also Spach Zarathustra (q.v.). Who can hum the remaining half-hour of that piece? Then there are those bits taken out from the middle of something very long, like the "Polovtsian Dances" from Borodin’s enormous opera Prince Igor or the "Sabre Dance" from Khatchaturian’s big ballet Gayne. These "lollipops" are often excerpted and played at pops concerts. I think they are among the weakest items in what are overall quite enjoyable works. Interestingly, in these cases, the over-rated excerpts contribute to the under-rating of the rest. Myself, I would much prefer to Bach’s highly-esteemed, but not in fact over-rated, Goldberg Variations. The opening theme is nothing to write home about. But as one listens it just gets better and better. Unlike the Beethoven, Strauss, or Khatchaturian, or most pieces by Tchaikovsky (q.v. ), it never outstays its welcome. And I don’t even mind when I hear eccentric Canadian pianist Glenn Gould singing along. I often get carried away myself.